The Predator can provide near real-time reconnaissance using a satellite data link system and perform attack missions as well. It served over the Balkans, Afghanistan, and during Operation Iraqi Freedom in 2003. The most historic use of the Predator and Hellfire missiles occurred when CIA ground forces directed attacks against Al Qaeda forces during the opening months of the war on terrorism. Highlighted in this image is the armament of the Predator. The Predator can provide near real-time reconnaissance using a satellite data link system and perform attack missions as well. It served over the Balkans, Afghanistan, and during Operation Iraqi Freedom in 2003. The most historic use of the Predator and Hellfire missiles occurred when CIA ground forces directed attacks against Al Qaeda forces during the opening months of the war on terrorism. Highlighted in this image is the nose of the Predator. The Predator can provide near real-time reconnaissance using a satellite data link system and perform attack missions as well. It served over the Balkans, Afghanistan, and during Operation Iraqi Freedom in 2003. The most historic use of the Predator and Hellfire missiles occurred when CIA ground forces directed attacks against Al Qaeda forces during the opening months of the war on terrorism. Highlighted in this image are the armament and undercarriage of the Predator. General Atomics Aeronautical Systems, Inc. MQ-1L Predator A: The Predator is capable of both reconnaissance and attack missions. It has been used in the Balkans, Afghanistan, Iraq and other global locations. The U.S. Air Force Predator displayed flew 196 combat missions in the skies of Afghanistan and was one of the first three UAVs to fly operational missions there after the 9/11 terrorist attacks. The Predator is currently on display at the National Air and Space Museum. The Predator can provide near real-time reconnaissance using a satellite data link system and perform attack missions as well. It served over the Balkans and Afghanistan and during Operation Iraqi Freedom in 2003. The most historic use of the Predator/Hellfire missile combination occurred when CIA ground forces directed attacks against al Qaeda forces during the opening months of the war on terrorism. This U.S. Air Force Predator was one of the first three UAVs to fly operational missions over Afghanistan after the 9/11 terrorist attacks. It went on to fly 196 combat missions in Afghanistan. It was also the first Predator to test fire the Hellfire missile, and the first UAV to fire Hellfire missiles in combat. With modifications to its wing length, propeller, avionics, and engine cooling system, it has served as the prototype for subsequent MQ-IL aircraft. As an aerospace milestone, the Predator marked several significant transformations underway at the beginning of the twenty-first century. The first was the dramatic shift from so-called “manned” to Remotely Piloted Aircraft Systems (RPAS). This shift had occurred slowly over much of the twentieth century as cruise missiles, target drones, and autopilots narrowed the role of onboard human pilots. The MQ-1 and other RPAS consist of “air vehicles” and ground-control equipment connected to the air vehicle by radio and satellite data links. In most RPAS, including the Predator, humans are essential to their routine operation. While no one flies on the Predator, and it often cruises under control of an autopilot, most of its functions occur at the hands of a pilot, sensor operator, and mission intelligence coordinator in the ground-control station. In this way, the Predator is more “manned” than many other combat aircraft. The second milestone represented by Predator was the ability of its operators to fly it remotely and fire precision weapons in real time from ground stations on the opposite side of the planet. This encouraged development of new strategic doctrines that allowed persistent observation and aerial attack against individual targets with the same weapon system. Previously, the use of separate systems for aerial reconnaissance and for weapons delivery, often involving different military organizations, created operational and bureaucratic delays of hours, and often days, that allowed targets to escape attack or resulted in mistaken targeting. In military parlance, the Predator “closed the sensor-to-shooter cycle” (i.e., the time between the identification of the target and the strike) and “accelerated the kill chain.” The use of the Predator as an “aerial sniper” ushered in a new form of warfare with its own cultural and geopolitical implications. Third, the Predator’s rise encouraged (but did not cause) a massive upsurge in the use of RPAS by the United States and created an unmanned arms race among other nations seeking similar capabilities. While the MQ-1 was not the most numerous military RPAS of the first decade and a half of the twenty-first century, the nature of its operations gave it a higher public profile than any other and colored the generic term “drone.” The dual nature of the Predator as an observation system and precision-strike aircraft complicated discourse surrounding other so-called drones as they came into greater civil and commercial use. The terrorist attacks of September 11, 2001, ushered in a sustained period of limited war for the United States in Asia and Africa that catapulted the Predator to prominence. The ability of hostile non-state organizations like Al-Qaeda, the Taliban, and the Islamic State to base in nations ostensibly allied, or neutral, to the interests of the United States posed a significant strategic challenge during the War on Terror. Whereas airstrikes, cruise missile strikes, and special operations forces were the primary mode of American operations against terrorist organizations before 2001, they often engendered significant resistance and resentment in local populations and thus were not politically sustainable. Because Predators operated out of sight, were unmanned, and their missiles caused less unintended death and destruction than other means, the MQ-1 and its further development, the MQ-9 Reaper, operated with less political resistance than traditional forms of intervention. The resulting “drone campaigns” over Afghanistan, Pakistan, Yemen, Somalia, Iraq, Libya, and Syria have left a complex legacy, with significant claims of success in eliminating terrorist leaders but also considerable concern and resentment arising in much of the world over “collateral damage” resulting in the deaths of bystanders. There has also been a tendency to wrongly assign blame to Predators for strikes carried out by other means, such as by combat aircraft of the sovereign nation where the MQ-1 was used. For some, the Predator represented a cold-hearted disregard for civilians. However, for American policymakers, military commanders, and a majority of the American public, “drone strikes” represented the most efficient and effective means of keeping deadly terrorists at bay—and did so with no risk to American service personnel. The Predator had an unconventional and rapid development cycle unusual in modern American military aircraft. The MQ-1’s origins go back to a garage project by Israeli emigrant Abraham Karem. By 1983, he had developed a small long-endurance tactical reconnaissance UAV prototype called the Albatross for the Defense Advanced Research Projects Agency (DARPA). Five years later, further development had resulted in a more advanced design, the Amber, with a superb loitering time due to its high-aspect-ratio sailplane-like wings. A further development, the GNAT 750, resulted in a production-worthy design. Karem’s company and the GNAT 750 were soon acquired by General Atomics. The Central Intelligence Agency (CIA) operated the GNAT 750 in operations over Bosnia and Herzegovina in 1993 and 1994. The program suffered from several technical issues, but it held enough promise that the Department of Defense expressed interest in a larger, more capable enhanced version of the GNAT 750 for medium-altitude tactical reconnaissance, soon designated RQ-1 Predator. By 1995, it too was operating over Bosnia and Herzegovina. At the time of the Predator’s introduction, the Navy-helmed UAV Joint Program Office controlled its development, and the Navy and Marine Corps were the only branches with tactical UAVs in regular use. The Air Force soon saw the Predator as an interim replacement for a shortfall in tactical reconnaissance aircraft with the added benefit of a live satellite video link. Authority for Predator development came under the 645th Aeronautical Systems Group, nicknamed “Big Safari,” which had responsibility for rapid development of reconnaissance systems outside conventional “mil-spec” airworthiness standards, resulting in a capable, but fragile, aircraft. In the late 1990s, Big Safari expanded the Predator’s capability to include a laser designator to illuminate targets and guide weapons dropped from other aircraft, reducing the sensor-to-shooter cycle. 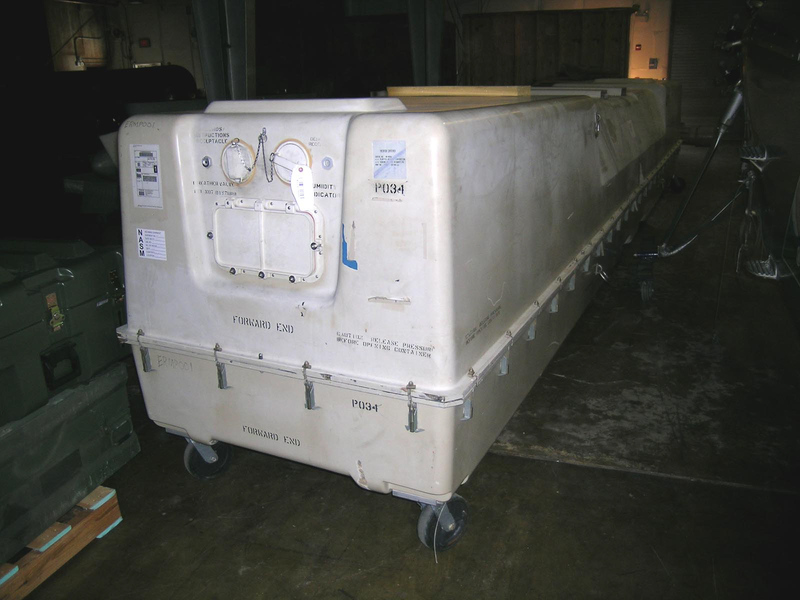 In 1999, this system had its first significant test during Operation Allied Force in Kosovo. One lesson learned was that the sensor-to-shooter cycle was still too great, as sometimes strike aircraft struggled to locate targets spotted by Predator. The solution was to explore options for arming the Predator with its own ordnance. By 2000, concern over the rising threat of the Al Qaeda terrorist organization and its leader, Osama bin Laden, encouraged Big Safari to accelerate the schedule for arming the Predator with the AGM-114 Hellfire laser-guided missile, originally developed for antitank helicopters. Given the requirement to make executive-level decisions about priority terrorist targets that might appear only briefly, the ability to watch Predator video and control the aircraft from the other side of the world in real time took on increased urgency. While Big Safari continued development in the United States, it also secretly operated several Predators from a base in Uzbekistan with the CIA during the summer and fall of 2000 to locate Osama bin Laden in Afghanistan. This paid off in September, with two and possibly three successful sightings, but President Clinton’s administration had not yet made a decision on direct military action against bin Laden, so the Predators soon returned to the United States. These operations also validated what would become the standard operational profile of the Predator in which a launch-and-recovery team at the operating airfield oversaw the takeoff and landing, but then passed control to a remote ground-control station via satellite, where a different crew managed the mission. Predator number 3034 demonstrated the first static firing of a Hellfire on January 23, 2001. In February, it began airborne trials of the Hellfire, and in April, with the addition of a new sensor ball and laser targeting system mounted in the nose, number 3034 had evolved into what would become known as the MQ-1—the armed Predator that would become the mainstay of anti-terror UAV operations for more than a decade to come. Continuing concerns over the legality of targeting an individual like bin Laden with the armed Predator delayed further deployments to Uzbekistan through the summer of 2001. On September 11, just as number 3034 and two other MQ-1s were undergoing final trials before deployment, the worst case Al Qaeda attacks occurred in New York and Washington, D.C.
By October 7, 2001, number 3034 was on nighttime patrol with two Hellfires near Kandahar, Afghanistan, then under control of the Taliban, the state patron of Al Qaeda in Afghanistan. On this sortie, number 3034’s crew successfully located Taliban leader Mullah Omar’s convoy and maintained a firing position and requested clearance to engage. In an incident that has been highly debated ever since, authorization from the US Central Command was delayed and Omar entered a structure. Concerns about potential incidental causalities and damage led to a decision to strike a Taliban security vehicle nearby in a ploy to flush Omar out into the open. This was the first Hellfire strike from a Predator and the first successful operational use of a precision-guided UAV-delivered weapon, though other unmanned aircraft had been employed in offensive operations. During World War II, UAVs loaded with explosives were used as weapons by both the United States and Germany. The U.S. Navy employed the unmanned Interstate TDR-1 using freefall bombs against Japanese targets. At the end of the Vietnam War, the Ryan Model 147 reconnaissance drone was tested extensively with laser-guided missiles and bombs, but never reached operational status. Predator number 3034 flew one hundred sixty-four operational sorties over Afghanistan between September 2001 and January 2003, with some missions lasting over twenty hours and an average of over fourteen hours. Between August and November 2002, during the middle of its operations from Uzbekistan, number 3034 undertook a detached deployment to another operational site where it flew thirty-two missions. This could have been either Operation Southern Focus over Iraq or deployment to Djibouti in the Horn of Africa to support a CIA surveillance program over Yemen. Given this aircraft’s close association with the CIA/Big Safari program, and the timing of initial operations from Djibouti, the latter scenario is more likely. During its probable time there, a Predator Hellfire strike killed Qaed Salim Sinan al-Harethi, who had masterminded the attack on the destroyer USS Cole. 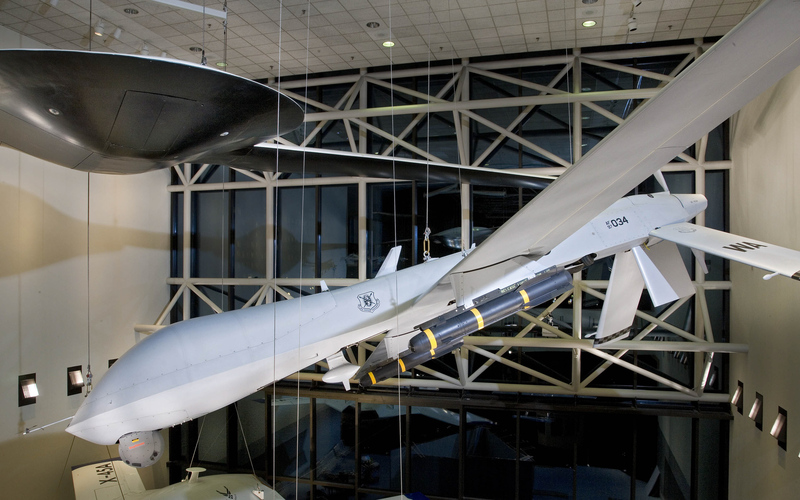 The National Air and Space Museum acquired Predator number 3034 in 2004 on the basis of its pivotal role in introducing armed RPAS into combat. Given the small number of strikes made by Predators compared to manned aircraft, the impact on doctrine was enormous. The success of the type in locating and killing top enemy leaders made it a favorite weapon of national security advisors and military commanders alike. In April 2001, the US military had only ninety non–target drone UAVs in service, seventy-five of which were small battlefield observation types: the RQ-2 Pioneer and the RQ-7 Shadow. The other fifteen were Predators. Four years later, the number had tripled. Ten years after that, the US military had nearly 11,000 UAVs on inventory. The Predator alone does not account for this profusion, but it unquestionably established the potential of the UAV to shape the battlefield and geopolitics in ways that no aircraft, manned or unmanned, had done before. Previously, military strikes consisted of fast jet pilots arriving over a chaotic scene with little time to understand the situation, releasing heavy ordnance, and then quickly departing. Accuracy in such engagements could be problematic, particularly with terrorists or insurgents who blended with the local populace. Instead, with the ability to remain airborne for up to forty hours (though operational missions rarely go much beyond twenty hours), Predator pilots and sensor operators could understand the ground situation far more clearly than in any previous aerial platform. The Hellfire missile, while powerful, also has a narrow blast effect, which made possible precision strikes that were impossible from manned aircraft. At a typical operating altitude of 15,000 feet above the terrain, the Predator was silent and invisible to those on the ground (though not stealthy to radar). This new mode of warfare came with new problems. Because the Predator bypassed the normal procurement process and did not have to meet conventional military standards for ruggedness and reliability it entered operations in something akin to a prototype phase of development. This contributed to an exceptionally high loss rate that reached 28 per 100,000 flight hours (eventually dropping to less than a quarter of that). Another concern was the “soda straw” effect of viewing the world through the tight focus of the camera lens and thus missing important nearby activity. This pushed investments in multiple camera array sensor systems that could monitor larger areas and use computer algorithms to highlight likely areas of concern, such as a vehicle driving in a certain manner or in the appearance of weapon system. USAF Predator production ended in 2011 with 268 airframes completed. Additional unarmed airframes were made available to allies, including the United Kingdom and Italy. The Army began development of a refined derivative, the MQ-1C Gray Eagle, which began operations in 2012. 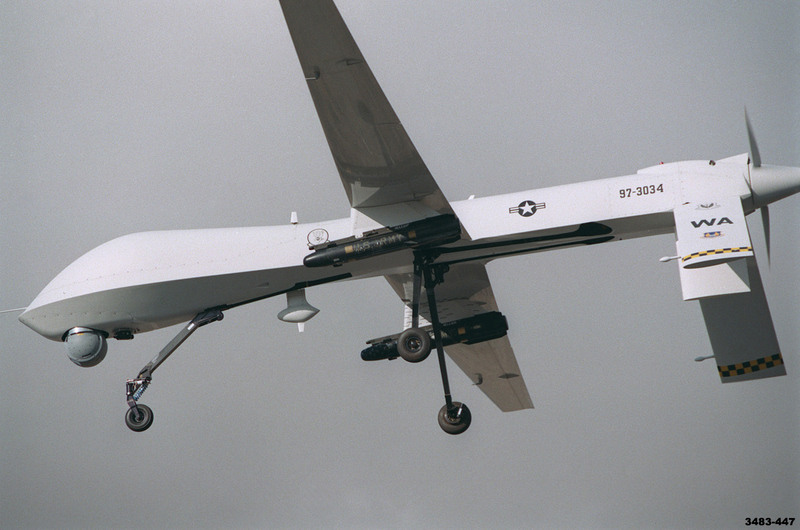 Even by the time of Operation Allied Force in 1999, the Air Force was aware that it needed a more capable and refined version of the Predator, so General Atomics began work on the “Predator B,” which entered operations in 2007 as the MQ-9 Reaper and slowly began replacing the Predator. The Reaper has twenty-five percent less endurance the MQ-1 but can carry considerably more ordnance: four Hellfire missiles and two 500-pound bombs. The Reaper and Predator are well matched to the nature of the Global War on Terror. For the most part, they have operated against terrorists and insurgents who lack aircraft and air defenses. However, as operations in Iraq, Syria, and Kosovo have shown, they are extremely vulnerable when opposed by a capable enemy, as they are slow and cannot maneuver aggressively. In 2002, the Air Force even adapted a Predator to carry Stinger missiles and attempted an air-to-air engagement with an Iraqi MiG-25—a dogfight that resulted in the loss of the Predator. The inability of Predator and Reaper to operate in contested airspace with effective enemy air defenses highlights the advances required for RPAS to maintain their operational significance. Jamming poses a significant threat to the Predator’s data links and GPS navigation, so future systems require significant advances in artificial intelligence and inertial navigation as well as faster and stealthier airframes. Another challenge is cultural—who is a pilot? Initially, most RPAS pilots for the US Air Force were experienced combat pilots, but demand soon exceeded supply and the military services began training non-pilot operators. This has created organizational frictions in the military over who has the privileges of pilot status in a world where unmanned and autonomous operations are increasingly important. Regardless, the Predator and subsequent RPAS have dramatically changed the strategy and tactics of limited war in the twenty-first century.